Rapberry Pies and DVMega / Bluestack HotSpot Toys! Been spending a lot of time on DMR (Digital Mobile Radio) these days. Recently ordered a DVMega / Bluestack Node and have been having a ball chatting with people all over the World. As a matter of fact I had a very nice TAC311 QSO with HL5KY in Korea on 2/4 @ 22:20 hours. The black PI is a PI3 Mod B where I run my Web Server, custom firmware for the Tytera MD380 called MD380 Tools and do some crazy Java Coding. 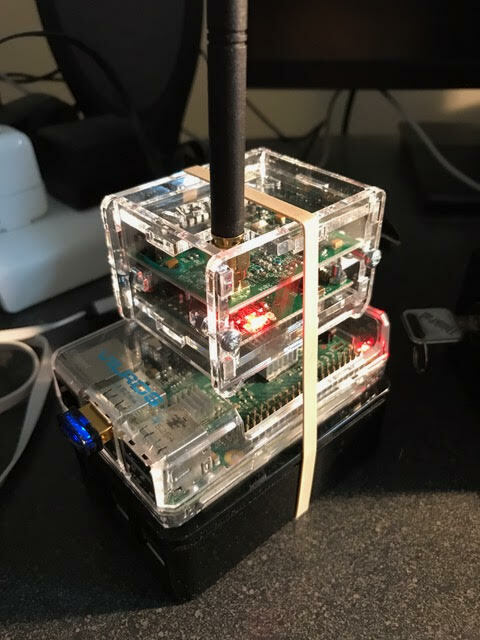 The clear PI is a PI2 and I experiment with all kinds of code like the unsupported BlueDV console for the BlueStack Node. And of course the top of the stack is the HotSpot. Right now the console is an Nexus 7 tablet running Andriod with the BlueDV console. Pleas note my HIGH TECH way of keeping the STACK together!!! If you are interested in finding out more about DMR, you can listen to DMR Ham Radio Operators talk on the various talk groups. A good place to start is to listen to talk group 3100. IMHO, one of the things I enjoyed most about the ARRL Centennial Convention in 2014 were the Amateur Radio related forums I attended on a ton of different topics. One of the forums I attended was Andy’s KB1OIQ’s presentation on his remastered version of Amateur Radio applications running on Ubuntu Linux. There are a bunch of these remixes like ShackBox floating around but I really enjoyed his presentation and his dedication to his project. Back then I downloaded and ran the version available at that time. It seems that his work continues to be popular since the current SourceForge page shows that he’s had almost 700 downloads just this week. Andy now has both a 32-bit and 64-bit version which contain a host of Ham Radio software like Fldigi, NBEMS, Gpredict and many more. Andy’s version 19 matches up with the Ubuntu 14.04.4 LTS release. As with Andy’s past versions, the GUI desktop is customized with menus for Amateur Radio use. Andy has gone through great pains to make the distribution lightweight so that it will also run on older computer hardware. Interested? Hop over to Sourceforge and grab Andy’s latest download! Digital Voice? A Replacement For SSB? According to this article, Amateur Radio is now transitioning from analog to digital voice. This is similar to the 1950’s – 60’s transition from AM to SSB it goes on to say. Suppose one company held the patent for SSB back then and forced you into their technology. Amateurs would be under their control indefinitely! As we all know, that is going on with digital voice right now. Enter FreeDV. FreeDV is a GUI application for Windows, Linux and MacOS (BSD and Android in development) that allows any SSB radio to be used for low bit rate digital voice. Find out more about FreeDV Here!